Laptops, projectors, tripods, projection screens, and CD/DVD players are available for checkout at the Digital Media Center. General info, handouts, tutorials, and workshops on presentation software Microsoft PowerPoint. General info and handouts about Prezi, a cloud-based presentation program. Instructions on how to launch, moderate, and participate in a Blackboard Collaborate session. The Digital Media Center can print oversized banners, posters, presentations, and more, up to 44" wide/tall. Visit our Printers, Scanners, Copiers, Faxes page to find prices and locations for black-and-white and color printing. These workshops focus on how to design and create posters and banners using a variety of software programs. General info, handouts, tutorials, and upcoming workshops about graphics editing software Adobe Photoshop. Photoshop enables you to edit photos, create collages, and much more. General info, handouts, tutorials, and upcoming workshops on vector-graphics program Adobe Illustrator. Illustrator is often used for drawing and tracing, creating logos, and designing posters. General info, handouts, tutorials, and workshops on desktop publishing program Adobe InDesign. InDesign is used to create brochures, newsletters, and other print publications. Topics include job hunting, developing a curriculum vita (CV), and writing for scholarly journals. An accompanying guide offers handouts and recordings from past workshops and info on upcoming workshops. General info, handouts, tutorials, and workshops on desktop publishing program Microsoft Publisher. 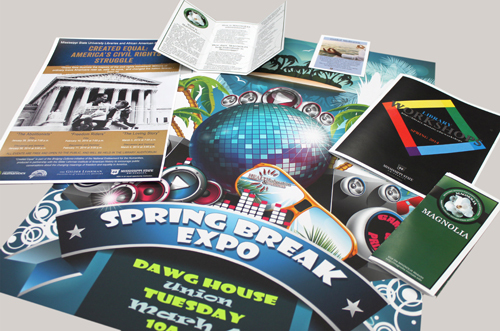 With Publisher, you can design business cards, letterhead, and even websites.